So I've been eyeing Uwe Rosenberg's highly rated farming game Agricola for awhile now but it just seemed too complicated to teach to my group of friends (we play a lot of Alhambra and Ticket to Ride...) That and I own Caylus and Stone Age so I'm not sure if it was necessary. 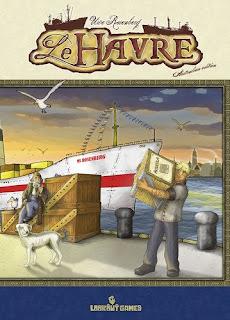 Now I've been reading up on Rosenberg's Le Havre which sounds like a simpler and some say better Agricola version 2.0. Maybe I'll just go with with that one. Tom Vasel claims it is the best game of the past year. Any thoughts? Agricola always has a tense, back to the wall type feel to it. Le Havre has less of that, and has more paths to victory, but every turn has many, many options and it can feel overwhelming. Regardless, both are GREAT games. Agricola isn't hard to learn to play, it's hard to learn to play it WELL.